Picking a good name for your game is hard. Overthink it and you end up with Infinite Undiscovery, but give it too little thought and you might think Booby Kids is a-OK. Truly bad naming aside—it’s one thing to come up with some fine names, quite another to pick the best one. What will resonate with your audience? Will they read the same things into it as you? 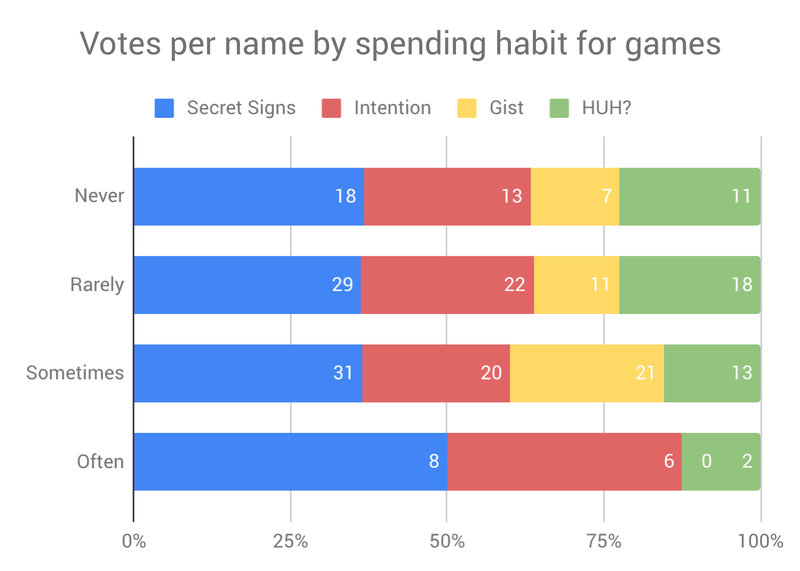 I faced this naming anxiety with my upcoming game and figured a way to make the decision confidently in one day with a $100 budget. I didn’t end up with the name I liked best—I ended up with a better one. If you are facing the same challenge, let me share with you how it did it. A game’s name, along with its app icon and maybe a screenshot, is all you get to convince someone browsing an app store to take a closer look at your game. Keep it short: you don’t want to see your name truncated in the app stores. Keep it simple: easy to spell and pronounce, preferably common words. Make it enticing: it’s entertainment, after all. Make it unique: You want to be memorable, and no trademark lawsuits. Gist: It’s about getting the gist of a level. Short, distinct and easy to spell. Intention: Similar to gist, but a more common word. Maybe a bit plain. Secret Signs: It’s about discovering a level’s secret meaning. Alliteration, nice rhythm, simple words, but a bit corny. If you’re an established game company, you already have a large audience to ask for help. If you don’t, asking family and friends may be tempting, but probably won’t get you the unfiltered feedback you’re after. Sites like UsabilityHub will recruit people to test your designs. Starting at $1 per response, getting a few hundred response is going to be expensive on an indie developer’s budget. This is where I turned to Amazon’s Mechanical Turk (AMT). This rather awkwardly named service lets you define a simple task and offers a large audience to run it by. As is typical for Amazon, they take a low commission and aim for volume. I could get five times more testers while paying each one double of what they would make at UsabilityHub. With a $100 budget, I could get nearly 500 testers! Beware: AMT is pretty bare-bones. You’ll have to build the survey and do the data analysis yourself. On the upside, you have full control! In the next section explains how I did all of that in a day. Note how the question is phrased: I am not asking which name you like, but which game you would be most interested to play. After all, we want to know which name will make people take action, so try to place them in that moment. Make sure you enable the “shuffle option order” option. This eliminates people’s bias towards the first and last answer. Next, I added 3 short questions. What made you choose this name? We’d like to understand why people chose one name over the others. If lucky, we discover qualities or weaknesses we aren’t aware of yet. Be aware that people will often look for arguments to support a mostly subconscious decision process, so critically review the responses. 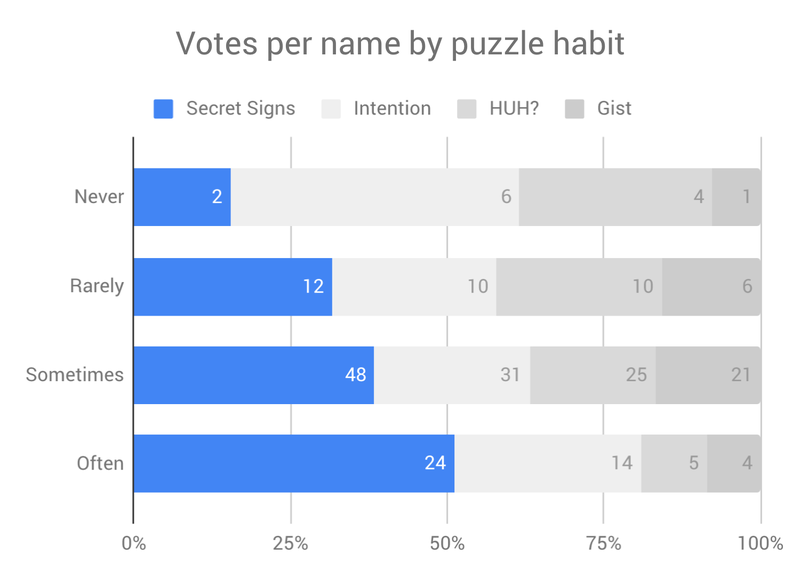 How often do you play puzzles games? Audience filters in AMT are expensive and broad. This question will show me if and how voting is affected by people’s affinity with puzzle games. How often have you paid for mobile games? I’m considering putting a price on (part of) the game. This question will show me if and how voting is affected by people’s willingness to pay for a game. That’s it! Let’s see what happened when I ran the test. AMT may not have the easiest setup or documentation (a topic for another article), but once it runs, it’s blazingly fast. I got all 220 responses in 15 minutes! 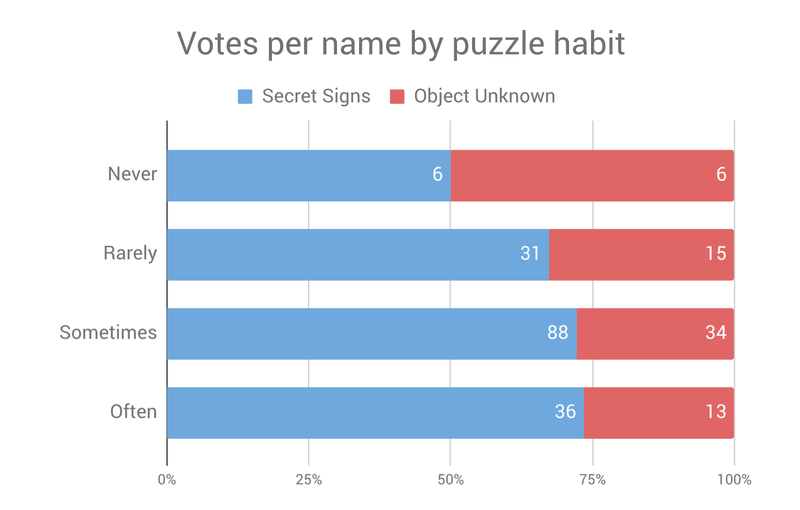 Secret Signs received almost 50% more votes than the second choice. My working title and personal favourite HUH? didn’t even get half as many votes—damn! If you’re curious to see how I turned my raw data into these charts, free to check out my Google Sheet! Respondents were also asked to motivate their choice. As I mentioned, not all written feedback is helpful or reliable, but stay critical and you might learn new, like I did. Looking through people’s writing, a trend emerged: Secret Signs elicited a sense of mystery. I thought it was fair to assume this was the main reason this name had won the first round. Clearly, what I had perceived as a quirky kind of mysterious, was seen by many others as dodgy, broken or too vague. 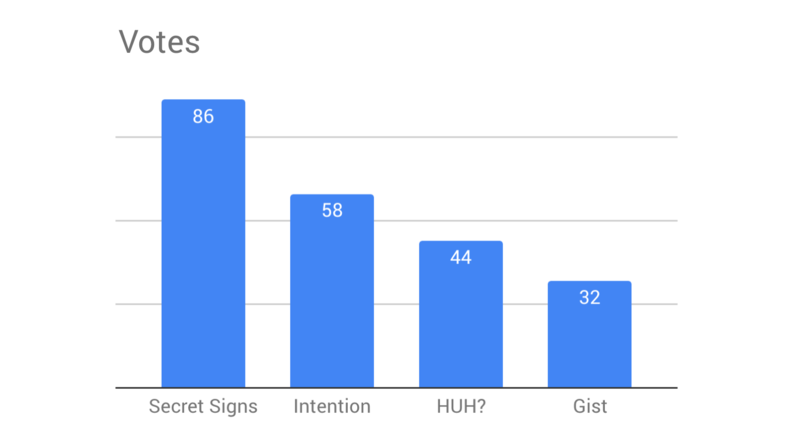 Secret Signs had won because it represented the unknown as an exciting discovery rather than a potential risk. 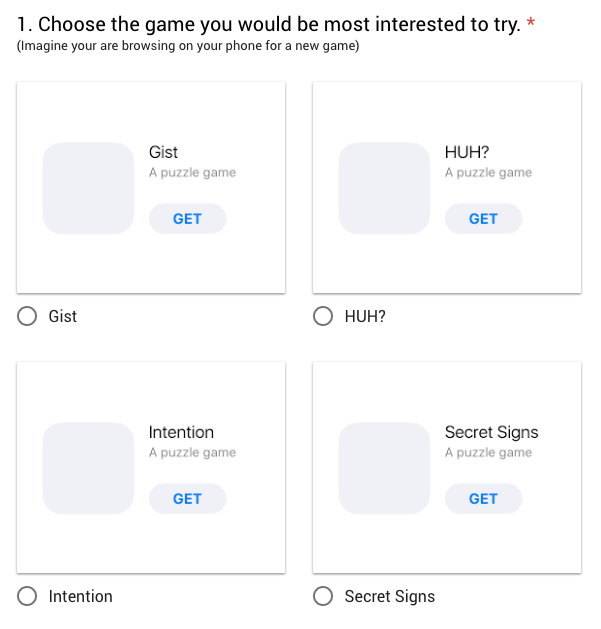 And so, the game was named Secret Signs and now lives on www.SecretSignsGame.com, currently as a demo with the first 10 levels! I hope you found some use or inspiration in my process. If you have any questions, feel free to reach out to me at hello@secretsignsgame.com. I came up with the names myself and was happy to us any of them. 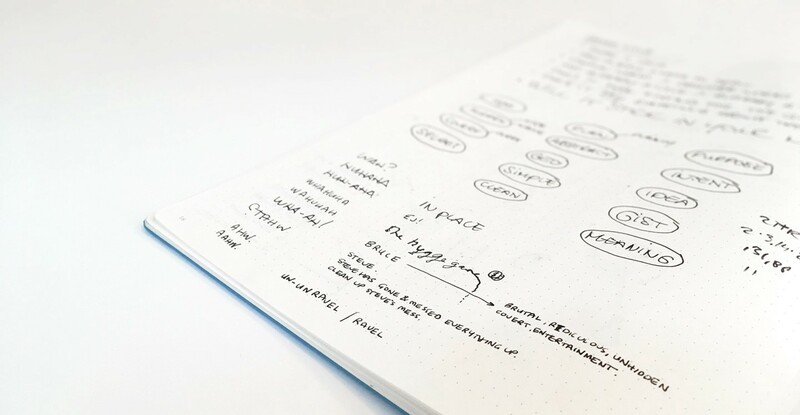 As a designer, I’m comfortable creating many options and using the input from others to inform my final decision. Truthfully, I don’t. 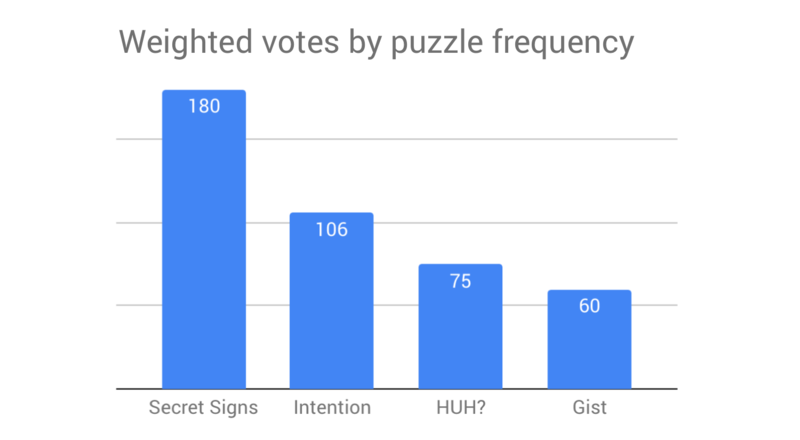 That said, if you’re aiming for general appeal within a genre like puzzle games, I suspect this kind of board sampling will give you a more accurate picture than, for example, asking a group of fellow game developers. I don’t know. While I know how to A/B test, I don’t know how to test for statistical significance in this situation. 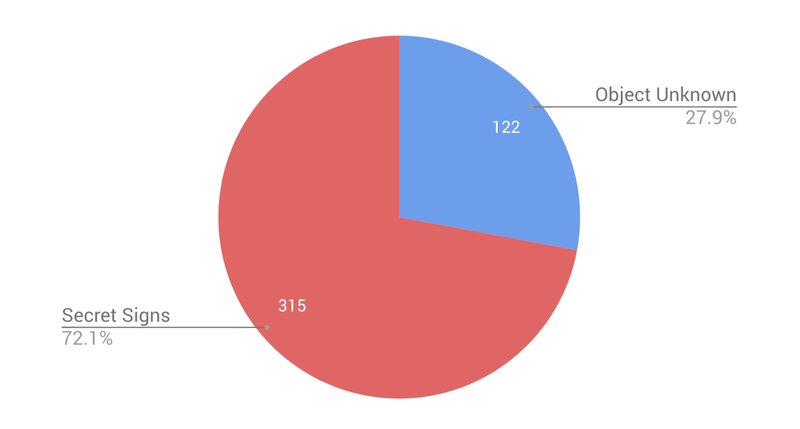 What I do know is that I got a lot more data to base my decision on than I did beforehand, and I’m fairly confident I ended up with a better outcome because of it. I like free things just like anyone else. However, I am spending a ton of time on building this game, which is a big investment. I’m happy spending $100 to confidentially decide on a name and be done with it. If you have zero budget, you could try posting your survey on gaming forums or so. It may take a little longer and you have to be aware of other biases in your sample group, but it’s totally doable. Makes digital stuff that works, is useful and sometimes even fun.